When the nest of the ant Formica fusca is taken over by a parasitic queen of another species, the colony is lost. But the larvae help to limit the damage, according to Unni Pulliainen and colleagues. An ants’ nest contains a large workforce serving the queen, which has the exclusive task to reproduce. 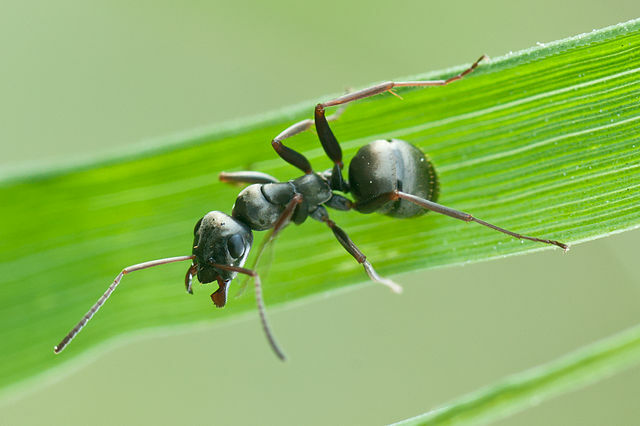 Worker ants feed the queen and take care of her offspring, keep the nest clean and defend it. Their diligence attracts the attention of queens of other ant species that have not yet workers and for that reason could use some help. The black ant Formica fusca often suffers from such queens, which may invade a nest to exploit the workforce – thereby destroying the colony. But the host may resist, Unni Pulliainen and colleagues report. If a hostile queen tries to enter a nest of Formica fusca, which lives in clear-cut forest areas and along forest edges in Europe and parts of southern Asia and Africa, the workers may detect her and kill her. But that doesn’t always happen; sometimes, they accept her. Once she’s inside, she can go on. She kills the resident queen or queens – in Formica fusca, a few queens usually live together in one colony – and she will start laying eggs. The workers have to raise her offspring as if they were the offspring of their own queen. The foreign queen, which outlives the workers, gradually acquires her own workers, while the original workers die. By temporarily parasitizing the Formica fusca colony, she founds her own. But the enslaved workers can limit the damage by sabotaging. The workers can remove the foreign eggs. And the orphan ant larvae seem to help. Ant larvae sometimes eat ant eggs, and Pulliainen wanted to know if Formica fusca larvae might be keen to consume the eggs of a foreign queen. In experiments, she offered larvae one egg each, either of their own queen or of a foreign queen, which belonged either to a parasitic species or to an innocent species that never invades other ants’ nests. The larvae never consumed an egg of their own queen. But when they were given an egg from a parasitic queen, they consumed it in one in ten cases; eggs of an foreign innocent queen were consumed less often. The feeding behaviour of the larvae, albeit not very spectacular, may help to limit the damage. The eggs are nutritious and their consumption may increase the orphan larvae’s chance of survival. Male larvae can leave to reproduce as adults. And some of the female larvae will be future queens, which may found a new colony elsewhere. Female larvae destined to become workers can be successful too. They are not able to mate, but they can produce some sons, as sons develop from unfertilized eggs. The colony may be lost, but some larvae still have a future.